Do you believe UFOs are extraterrestrial or supernatural in nature? Then this book just might rock your world. David Clarke shares his journey of researching the UFO phenomenon and his realization that the best explanation for it is psychological, rather than extraterrestrial or supernatural. Available in both hardcover and Kindle formats. 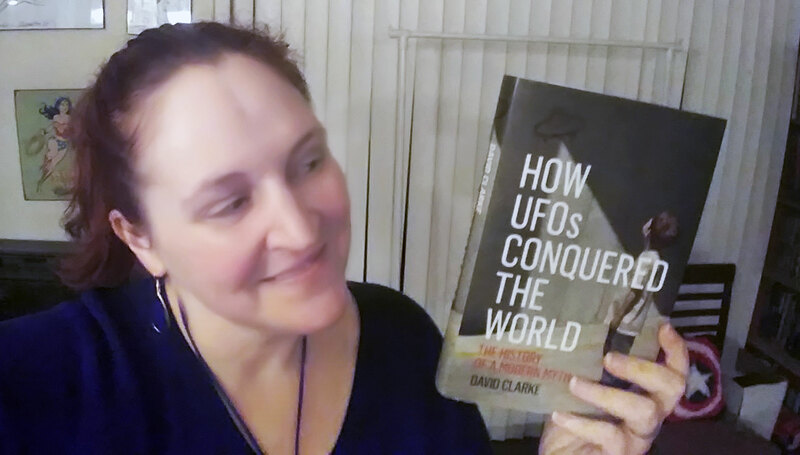 In this superbly written book, part memoir, part exposé, Clarke takes the reader on a journey through the history of the UFO phenomenon. The book spans from 1947, when an American pilot spotted nine mysterious objects, to modern times. Along the way, readers will meet abductees, hoaxers and conspiracy theorists. Do you want to believe? Maybe you shouldn’t. The author was a child during the 1970s, as was I, so the familiar references were pleasantly nostalgic for me. Also, because I once wanted to be a UFOlogist, it was fun learning more about this topic. The book is well researched and includes engaging anecdotes and stories. And the writing was so good. I thoroughly enjoyed reading it. Because this book is from a British perspective, I got lost sometimes when the author would use a term that a Brit would understand, but an American would misunderstand due to different contexts. I think if this book is meant for an international audience, that those types of terms should be defined upon the first mention. I really can’t think of anything that would make this book better, unless the 2.0 version included links to videos that would solidify or exemplify what was being discussed in the chapters. I could totally see this book having a mini-website with media-rich — additional photos, movie and TV clips, and other video footage — content to expand on the book. If you have an open mind, you can enjoy the well-researched, well-written book. If you’re bound and determined to keep whatever opinion you have about UFOs, then you might be enraged by his conclusion. Regardless, this is an entertaining read for arm-chair UFO enthusiasts, UFO historians and those who are just plain curious about the UFO phenomenon.